The Caprimulgiformes is an order of birds that includes a number of birds with global distribution (except Antarctica). They are generally insectivorous and nocturnal. The order gets its name from the Latin for "goat-milker", an old name based on an erroneous view of the European nightjar's feeding habits. Traditionally, they were regarded, on morphological grounds, as being midway between the owls (Strigiformes) and the swifts. Like the owls, they are nocturnal hunters with a highly developed sense of sight, and like the swifts they are excellent flyers with small, weak legs. At one time or another, they have been allied with owls, swifts, kingfishers, hoopoes, mousebirds, hornbills, rollers, bee-eaters, woodpeckers, trogons and hummingbirds. Based on analysis of DNA sequence data – notably β-fibrinogen intron 7 – Fain and Houde considered the families of the Caprimulgiformes to be members of the proposed clade Metaves, which also includes the hoatzin, tropicbirds, sandgrouse, pigeons, kagu, sunbittern, mesites, flamingos, grebes and swifts and hummingbirds. This clade was also found by the expanded study of Ericson et al. (2006), but support was extremely weak. While only the latter study recovered monophyly of the Cypselomorphae (see below) within Metaves, the former was based on only a single locus and could not resolve their relationships according to standard criteria of statistical confidence. No morphological synapomorphies have been found that uniquely unite Metaves (or Caprimulgiformes for that matter), but numerous unlinked nuclear genes independently support their monophyly either in majority or whole. Ericson et al. 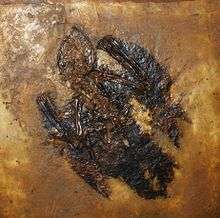 (2006) concluded that if valid, the "Metaves" must originate quite some time before the Paleogene, and they reconciled this with the fossil record. While the relationships of cypselomorphs are a subject of ongoing debate, the phylogeny of the individual lineages is better resolved. Much of the remaining uncertainty regards minor details. Initial mtDNA cytochrome b sequence analysis agreed with earlier morphological and DNA-DNA hybridization studies insofar as that the oilbird and the frogmouths seemed rather distinct. The other lineages appeared to form a clade, but this is now known to have been caused by methodological limitiations. The Aegothelidae (owlet-nightjars) with about a dozen living species in one genus are apparently closer to the Apodiformes; these and the Caprimulgiformes are closely related, being grouped together as Cypselomorphae. The oilbird and the frogmouths seem quite distinct among the remaining Caprimulgiformes, but their exact placement cannot be resolved based on osteological data alone. Even the study of Ericson et al. could not properly resolve the oilbird's and frogmouths' relationships beyond the fact that they are quite certainly well distinct. It robustly supported, however, the idea that the owlet-nightjars should be considered closer to Caprimulgiformes, unlike the methodologically weaker studies of Mariaux & Braun (1996) and Fain and Houde (2004). Alternatively, Mayr's phylogenetic taxon Cypselomorphae might be placed at order rank and substitute the two present orders Caprimulgiformes and Apodiformes. Such a group would be fairly uninformative as regards its evolutionary history, as it has to include some very plesiomorphic and some extremely derived lineages (such as hummingbirds) to achieve monophyly. The fossil record of caprimulgiform birds (in the loose sense) is rather scant. Nonetheless, it supports the emerging consensus phylogeny well. The genus Paraprefica, probably from the Early Eocene (though this is somewhat uncertain), seems to be a basal form that at times has been allied with the oilbird and the potoos, but cannot be assigned to either with certainty. In the consensus scenario, it would represent a record of the initial divergence of the three lineages. This nicely agrees with fossils suggesting that the basal divergence of the owlet-nightjar and apodiform branch also occurred during that time. In addition, Eocypselus, a Late Paleocene or Early Eocene genus of north-central Europe, cannot be assigned to any one cypselomorph lineage with certainty but appears to be some ancestral form. These Paleogene birds strongly suggest that the two main extant lineages of cypselomorphs separated about 60-55 mya (Selandian-Thanetian), and that some time around the Lutetian-Bartonian boundary, some 40 mya, the common ancestors of Nyctibiidae, Caprimulgidae and eared nightjars diverged from those of oilbird and frogmouths. Caprimulgiform birds typically lay small clutches: frogmouths and potoos lay only one egg; nightjars one or two, and the Oilbird usually three. With the exception of the Oilbird, which nests colonially in tree hollows, caprimulgiform birds do not build a nest but lay their egg or eggs directly onto the ground or branches. Both parents usually incubate, and for camouflage the semialtricial chicks, covered with down at hatching but immobile, are often coloured white like the eggs. Little is known of the life history of many members of the order especially of maximum lifespans and age at first breeding. Most caprimulgiforms are monogamous, with the same pair breeding for many years, though only the eared nightjars typically produce more than a single brood per year. 1 2 Fain, Matthew G.; Houde, Peter (2004). "Parallel radiations in the primary clades of birds" (PDF). Evolution. 58 (11): 2558–2573. doi:10.1554/04-235. PMID 15612298. Archived from the original (PDF) on 2013-04-07. 1 2 Ericson, Per G.P. ; Anderson, Cajsa L.; Britton, Tom; Elżanowski, Andrzej; Johansson, Ulf S.; Källersjö, Mari; Ohlson, Jan I.; Parsons, Thomas J.; Zuccon, Dario; Mayr, Gerald (2006). "Diversification of Neoaves: integration of molecular sequence data and fossils" (PDF). Biology Letters. 2 (4): 543–547. doi:10.1098/rsbl.2006.0523. PMC 1834003 . PMID 17148284. 1 2 Mariaux, Jean; Braun, Michael J. (1996). "A Molecular Phylogenetic Survey of the Nightjars and Allies (Caprimulgiformes) with Special Emphasis on the Potoos (Nyctibiidae)". Molecular Phylogenetics and Evolution. 6 (2): 228–244. doi:10.1006/mpev.1996.0073. PMID 8899725. ↑ Cracraft, Joel (1981). "Toward a phylogenetic classification of the recent birds of the world (Class Aves)" (PDF). Auk. 98 (4): 681–714. JSTOR 4085891. 1 2 Mayr, Gerald (2002). "Osteological evidence for paraphyly of the avian order Caprimulgiformes (nightjars and allies)". Journal für Ornithologie. 143 (1): 82–97. doi:10.1007/bf02465461.